Access to the eSignatures service is granted only after the completion of an onboarding process, which includes a risk assessment for each document type that will be sent through the eSignatures service, and training for your team’s technical contact. University of Washington departments interested in using the eSignatures service for business purposes should follow the eSignatures onboarding process outlined below to get started. Note: Because eSignatures can involve legally binding signatures, this process will take four to six weeks. Complex usage can take longer as it will require additional approvals. Select simple forms: Work with your department to identify a few simple forms you would like to start out with. Simple forms are those that are sent out to specific recipients for signatures and, if needed, the entry of some information. While more advanced forms are possible, they require more expertise in DocuSign (the eSignatures tool) and aren’t recommended as a starting point. Consider who will be the technical contact: Decide who in your organizational unit should be the technical contact for your account. This is often a central IT department or business unit. They will be in charge of member management and be a technical resource for learning about DocuSign and requesting additional support. Begin the onboarding process: Request that your technical contact reach out to UW-IT with the eSignatures Interest Form. Our onboarding process will guide them through the steps necessary to ensure that eSignatures is a good fit for your team’s needs and confirm that your intended usage meets University policy and guidelines for eSignature usage. Note: eSignatures are governed by State and University policies; it is not possible to send documents for electronic signature without going through the onboarding process. Send interest form: Your technical contact should use the eSignatures Interest Form to indicate departmental interest. Initial review: Receive initial review and access to the DocuSign sandbox. Test in sandbox account: Your team is expected to use the sandbox account to get a feel for how the eSignatures sending and signing process works and understand what your team will need to do to get your forms ready for eSignatures. The sandbox must not be used for official University business. Submit additional info: Your team will need to provide more information on your intended eSignatures usage to begin the risk assessment process. 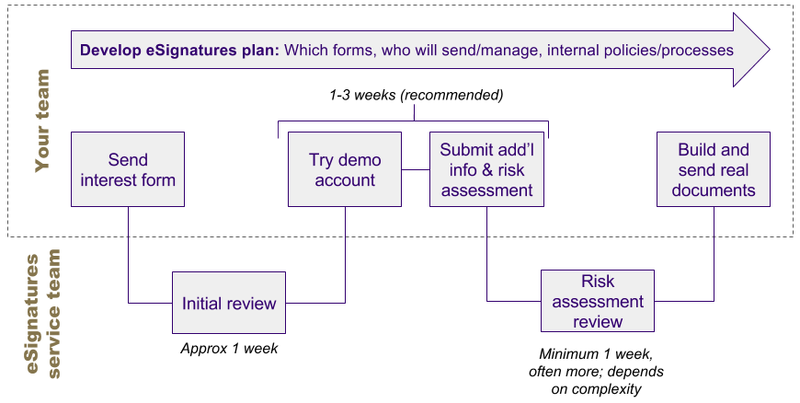 Risk assessment review: The eSignatures Service team will review your risk assessment details. Depending upon the complexity of your forms, additional information may be required. Receive DocuSign access: For approved risk assessment forms, departments will receive access to the live DocuSign account. Your team’s technical contact must go through DocuSign administrator training before your team can begin to send documents through DocuSign. A document completed in Word that needs signatures from specific people. Are DocuSign signatures legally binding? Electronic signatures provided by DocuSign are legally accepted by regulatory and governmental bodies. DocuSign is offered at no cost through FY2019. Can I send or receive HIPAA-protected information through DocuSign? No — currently, the eSignatures service may not be used for documents that contain or request HIPAA-protected information. the monetary loss, or other adverse impact, that could result from such a successful challenge to the enforceability of the electronic signature. In order to allow the University to adequately assess such risk, departments must submit a preliminary risk assessment form, and, if required, a risk assessment form, which will be evaluated centrally. The University will evaluate the risks associated with the proposed use, based on the information provided, and determine whether a particular use of an electronic signature solution is appropriate. Approval of a particular use of an electronic signature solution shall not constitute approval of other uses of an electronic signature solution or approval of the use of a different electronic signature solution.